Virtualmin provides webmasters with ability to install various scripts onto virtual servers to aid in managing of system components or quickly install popular web apps. These scripts include WHMCS, X2Engine, phpMyAdmin, phpPgAdmin, Django, RoundCube, SquirrelMail and etc. If you install many scripts through “Install Scripts” onto many virtual servers (websites), it’s time consuming and troublesome to switch to each and every virtual servers to perform the upgrade to scripts which have update available. Expand System Settings and go to Scripts Installers. Go to Upgrade Scripts tab. 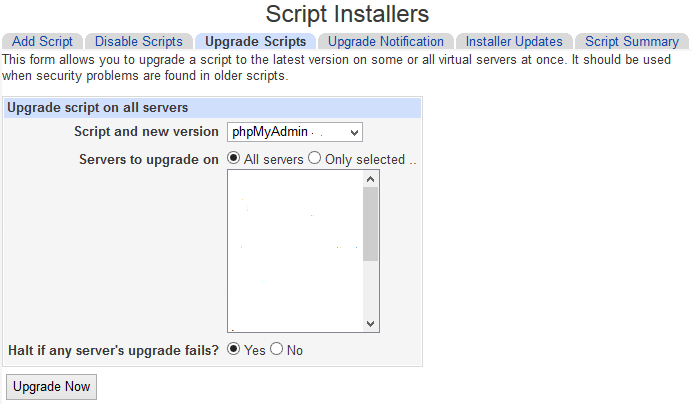 Select the script to upgrade in Script and new version drop-down list and virtual servers to perform the upgrade on in Servers to upgrade on drop-down list. 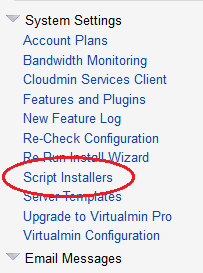 Virtualmin will automatically skip the virtual servers that do not installed with the script to be upgraded. Click Upgrade Now when done. Virtualmin will display a summary of operation on virtual servers which the script will be updated, with their currently installed versions and paths. 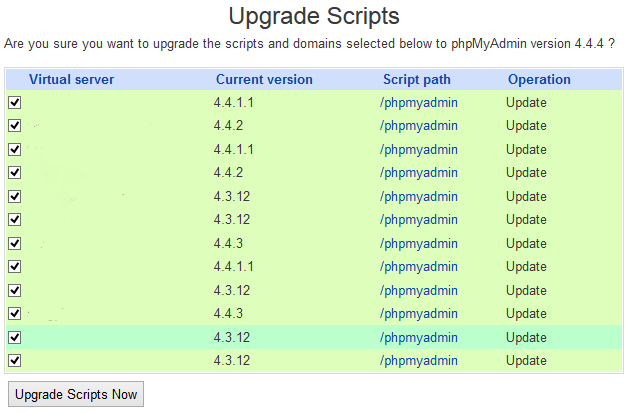 Click Upgrade Scripts Now to perform the update instantly for all websites at once.